Ever Prayed with an Icon? I facilitate a multicultural spiritual direction group of half a dozen women every other Monday night at an Episcopal Church. This week we are practicing the spiritual discipline of praying with icons that isn’t often practiced in protestant denominations. And, by icons, I don’t mean famous people! I mean the 2-D paintings. Icons were originally a way of communicating the stories of scripture and saints to the illiterate. We are using these ancient icons to do something very similar. In deep meditative prayer, we gaze upon them considering the stories and lives portrayed in them watching for how the Holy Spirit might speak to us through what we see. 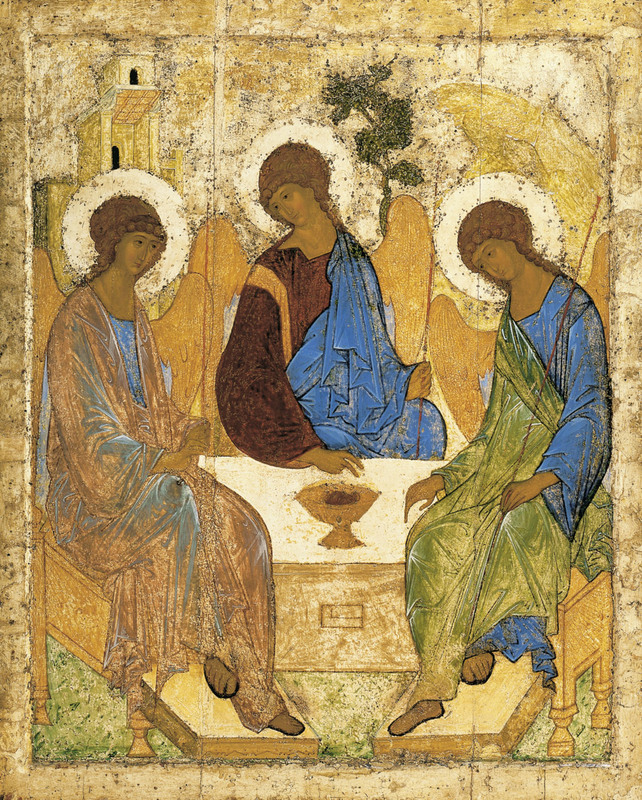 The icon that I have been gazing at is the icon of the Trinity painted by Rublev in the 15th Century. It shows the Father, Son, and Holy Spirit gathered around a table having a conversation. One side of the table has an opening. I have taken this to mean that they are inviting us to sit down and join in their conversation. After all, isn’t that what we do when we pray? The curious thing is . . . the first day that I prayed, I had a hard time sitting down at the table with the trinity. Oh I know the theology – I know the Holy Spirit makes it possible through Jesus’s work on the cross and in the resurrection for me to sit at that table and be in relationship with God. But yet, I had a hard time sitting down. Not exactly because I thought that I didn’t belong at the table, but because in my subconscious, I thought they might get up and leave. See, I had an experience a while back where God made way for others and not me to do something I really wanted to do. Something I think God wanted me to do too. Everyone has probably experienced this at one time or another – you know, you didn’t get into the school you wanted, you didn’t get the promotion you wanted, the person you wanted to date said, “no way.” Anyway, I was feeling confused about why God hadn’t fully opened doors that I thought God was telling me to go through. So as I gazed at the icon, I realized that I didn’t want to sit down at the table if the trinity was going to run out the door and leave me sitting there yelling, “wait for me!” Of course, the trinity wouldn’t actually do that. Hasn’t actually done that. But I felt like they had. And it wasn’t until I spent time praying with this icon that I realized how I was hesitating to give up all my hurt feelings and sit down anyway. Trust. I needed to trust them so that I could sit down at the table and listen to them. It’s hard to be a servant of Christ if you don’t trust the trinity enough to sit down and chat. So the next time I prayed, I entered the painting, pulled up a chair, and sat down. Now I am ready to listen. Try praying with icons. Henri Nouwen used to do it whenever he was too tired to pray with words. Henri Nouwen explains the practice in his book called Behold the Beauty of the Lord. April writes about scripture and spiritual disciplines. See her latest book, James in the Suburbs. Beautiful words, April! I haven’t tried this practice yet, but you make me want to. And I love that icon of the Trinity- it keeps popping up in many places for me. I wonder if it’s telling me something.